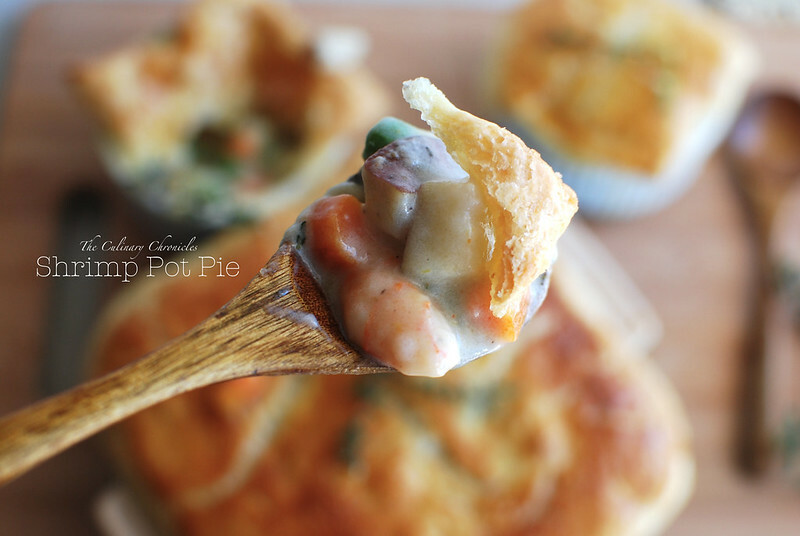 Shrimp Pot Pie for π (Pi) Day! Excuse me while I geek out because today is π (Pi) Day!!!!!!!!!!!!!! 3.14 – you know it! To be honest, I can’t say I love math……. but I can’t help but adore kitschy humor. So if given the opportunity to celebrate pie–I’ll take it! Last year I celebrated the mathematical constant with these Mixed Berry Hand Pies that were not only scrumptious but just so darn cute and portable. 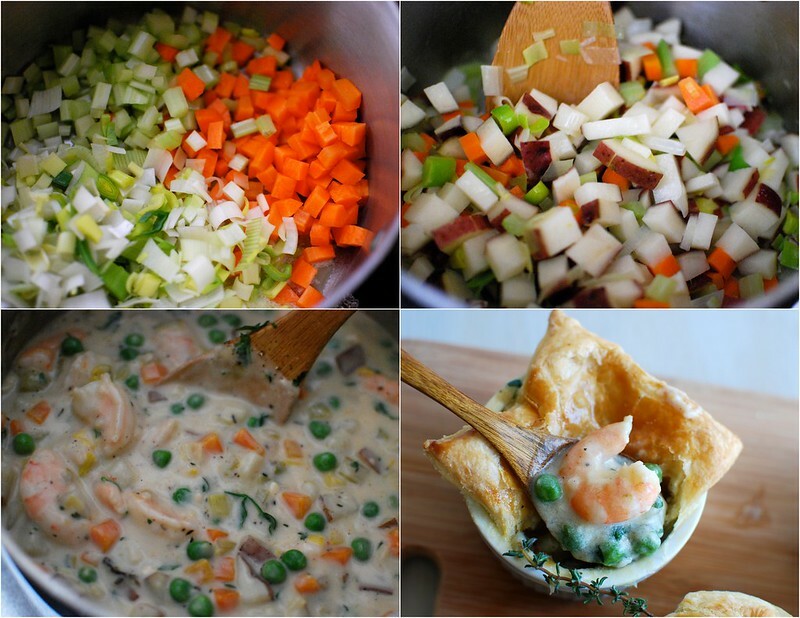 This year I opted for the savory route and made a batch of Shrimp Pot Pie. 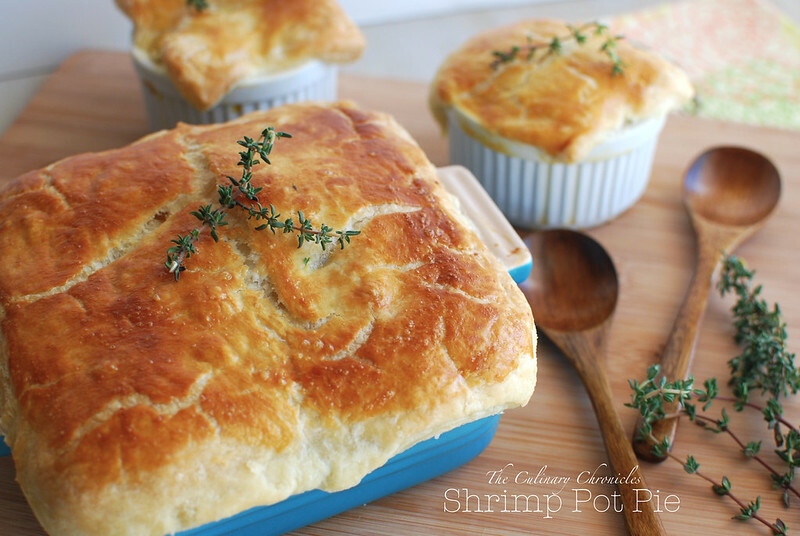 Luscious, decadent shrimp filling topped with a flaky puff pastry crust. So good, so easy, so π-licous. In a pot, melt the butter with the olive oil over medium heat. Add the celery, carrots, leeks and garlic. Sauté until softened but not browned—about 5-7 minutes. Add the red chili flakes, thyme sprigs, potatoes and cook for 2-3 minutes, stirring frequently. Pour in the wine . Continue simmering until the wine has reduced and nearly evaporated. While the wine cooks, sprinkle the cayenne pepper over the shrimp and toss until evenly coated. Next, whisk the flour and seafood stock together in a bowl. When the wine has evaporated, pour in the flour/stock mixture and stir while the liquids come to a soft boil. Continue cooking and stirring over medium heat for 5 minutes. Pour in the cream and cook for an additional 2-3 minutes until the mixture has thickened to the desired consistency. Pull the pot off the heat and remove the thyme sprigs. Stir in the shrimp, 1 teaspoon kosher salt (more to taste), ½ teaspoon black pepper (more to taste), frozen peas and fresh parsley. Ladle the filling into a casserole dish or other types of individual ramekins/ovenproof dishes. Brush the outside edges of the dishes/ramekins with the beaten egg. 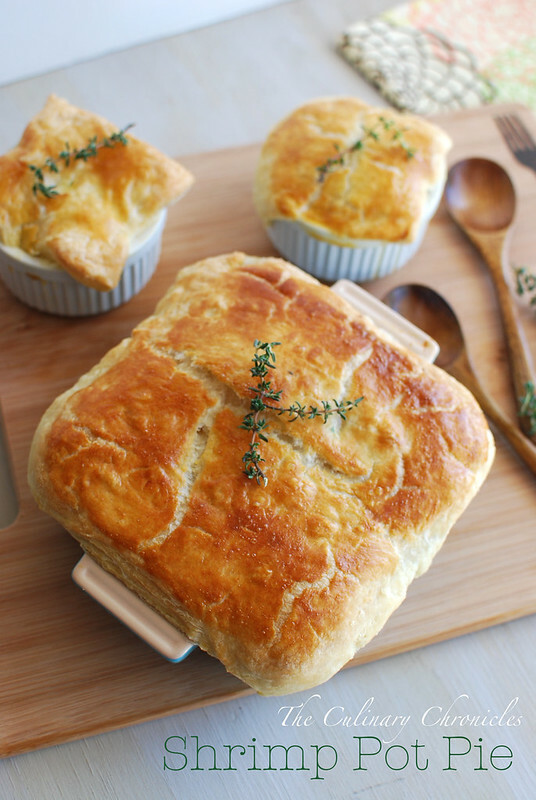 Trim the puff pastry sheets about ½ inch larger than the tops of each of the dishes/ramekins. 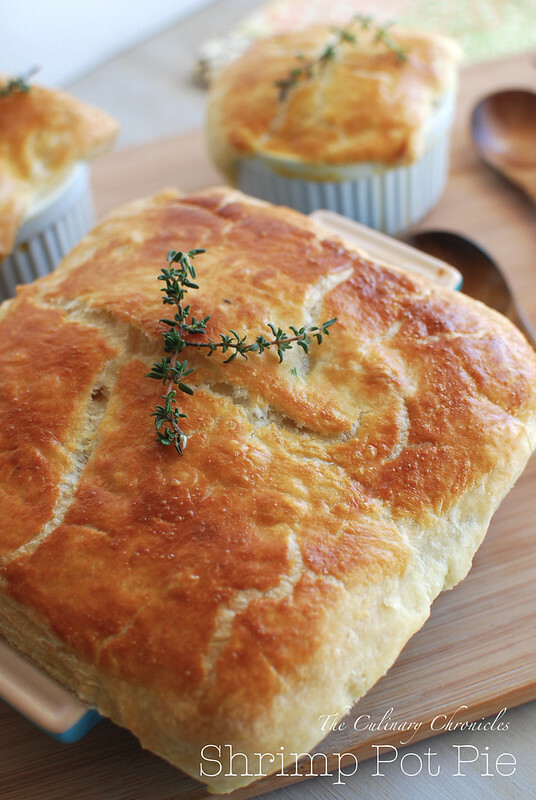 Cover each dish/ramekin with the puff pastry and press around the edges to seal. Brush the tops of each of the pies with the beaten egg and use a sharp knife to make small slits on top. Place the pie/pies on a baking sheet lined with aluminum foil and transfer to an oven that has been preheated to 400 degrees F.
Bake the pie/pies for 30-40 minutes or until the crusts are golden brown. Next Post Thin Mints Chocolate Cheesecake ….Happy St. Patrick’s Day! Well, I hope this doesn’t sound too dumb but is seafood stock something you can buy or must you make it? Living in the Midwest seafood is kind of an iffy thing when you can find it but this looks so good I want to give it a go. However the idea if making my own stock sounds more arduous & expensive than the rest of the recipe combined. Any ideas? Thanks! Sorry for the delayed reply Leslie! I usually make my own seafood stock when I use shrimp (or other seafoods) in a different recipe. I throw the leftover shrimp shells with some aromatics and simmer with water for a few hours. That way, it’s not expensive at all. But it sounds like you found a trusted source with Swanson 🙂 Hope it all goes well! We’ll silly me! Swanson makes it & I found it in the grocery store in the soup aisle w/ the boxes of chicken & beef stock. I had no idea, so I’m good to go. This is definitely going on my “To Make” list! I even have some shrimp shells saved up to make the stock. YAY!